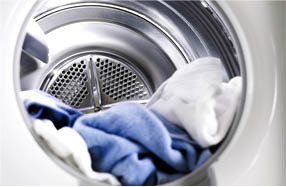 Dryer repairs can be as complex and confusing as they are difficult to deal with. If you don’t know how the parts of your dryer fit together, it can often seem like these problems occur out of the blue – one minute everything’s working fine, then the next your machine’s making strange rumbling sounds, vibrating in a way you’re not used to, or just refusing to dry your clothes properly. There are a few things you can do to make sure your dryer stays in good condition – monitoring the lint trap and keeping it clean to avoid the risk of fire, for example – but sometimes simply trying to take care of it on your own isn’t enough. One of the most common warning signs that your dryer is in need of professional appliance repair is that it simply isn’t drying your clothes the way it used to – and if this is the case, after you’ve taken all the steps to ensure the problem isn’t one you know how to fix, your next step should be to contact us. There are a wide range of issues that can come up as your dryer gets older, but at Toronto Refrigeration, our dryer repair technicians are equipped to handle all of them, from problems caused by accumulation of dust and lint to hardware breakdowns. Our experienced and qualified appliance repairpeople are ready to perform any kind of dryer repair Toronto residents might find themselves in need of, no matter what the make and model of your appliance. Our company has a proud tradition of only employing the most experienced and well-trained appliance repair technicians in Toronto. Few other companies in the GTA compare to Toronto Refrigeration in terms of quality of service and fair, affordable pricing. We always offer convenient scheduling and appointments that are designed to work around your busy schedule. Our staff are prompt, friendly, and will resolve your issue once and for all, no matter what it is. Dryer is making strange noises or vibrations. Dryer runs, but never heats up. Dryer runs, but does not get my clothes dry. Dryer runs, but takes a long time to dry my clothes. Dryer runs, but then shuts off quickly.. The timer on Dryer does not shut off..
Dryer runs, but the clothes come out wrinkled. Dryer makes a screeching sound. Dryer runs with the door open.. Call TorontoRefrigeration Appliance Repair Service Now For High Quality Toronto Appliance Repair Toronto Dryer Repair That Is Affordable And Effective.